This is a good combination. We had it with a roasted shoulder of lamb and it worked well. This turned out to be a great side dish for grilled Italian marinated lamb chops. Salting and draining the zucchini first meant the zucchini kept its shape and a bit of crunch despite sauteing and then baking. The flavors of the various vegetables blended nicely. My guests loved it and requested the recipe. Nice change from mushy bland zucchini! p. 210 - First use of this recipe and book. Disappointing but no fault of the recipe, rather it was our pricy organic Mennonite flank steak from NOTL that was a tough, inedible mess. This marinade was tasty and next time I'll boil it as a sauce as the author suggests. Very simple to pull together. I'd like to try this again and hope for a better piece of meat. We marinated overnight and cooked a little under med-rare as always. It couldn’t stand alone as the only Italian cookbook that someone owns but it’s an incredibly inspiring Italian cookbook. 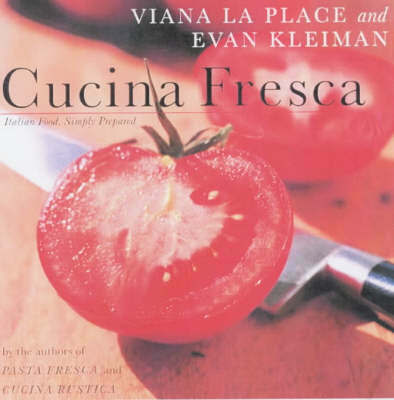 Italian in its inspiration, American in its outlook, Cucina Fresca brings a vivid new style to the earthy simplicity of Italy's culinary tradition. This is food at its freshest and simple to prepare.